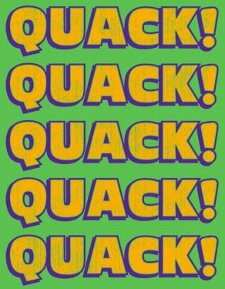 I feel like the first couple quacks should have question marks after them, the one with no punctuation, then two with the exclamation point, because the first time Emilio gets them to do the chant, they’re not sure what’s going on for a minute. But, then they really get into it. I suppose I can accept this version of the Quack! Quack! Quack! Quack! Quack! T Shirt. I mean I trust Snorg Tees beyond reason, so if they pumped it out it must be perfect. Actually, that’s not true, they’ve done a clunker here and there, but this is a very nice shout out to the classic kids hockey movie.